Mangaluru, June 8,2017 : Local buses plying between Mangaluru and Talapady staged a flash protest for nearly an hour on June 7, Wednesday following a dispute over collection of toll charges. The traffic was restored to normalcy after local police intervened. 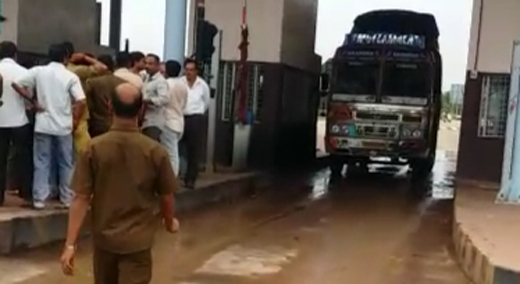 The verbal clash arose after Shiva who had assumed office as manager of the tollgate on Wednesday directed the staff to collect toll from local buses as against the earlier agreement of exempting the local buses from payment of toll. The exemption of toll charges was also extended some time back after consultations with NHAI and Navayuga Company. On Wednesday when the staff demanded toll from the buses there was a verbal altercation which however was soon settled.